To everyone who took part in my Author Roast & Toast on Friday and Saturday. Who would have guessed that having an on-line party could be as much fun as having a real one or that virtual drunken revelry could last much longer than normal drunken revelry? 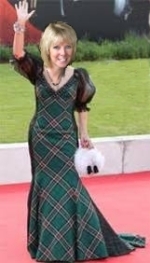 My Highland Gathering party to celebrate my humorous romance novel Bagpipes & Bullshot kicked off at 10am on Friday morning and by 6pm that evening, I had been sitting at my laptop for most of the day, typing, giggling, and having a fantastic time. When the sun went over the literal yard-arm as well as the virtual one here in Scotland, believe me, I was ready for a very real glass of bullshot and was happily singing ‘The bonny bonny banks of Loch Lomond’ for real too! As early evening became late evening and there were something approaching two hundred comments on the blog, my wonderful Author Roast & Toast hostesses and I declared the whole event to have been amazing fun and a tremendous success, and I thought about collapsing on the sofa next to my dear husband (who had tried hard to understand the concept of a virtual party but failed). But I had forgotten one very important and crucial thing to do with the world being round and not flat - and that was of timing and time difference. You see, as I saw the sun go down and the moon come up, for my dear friends across the pond and beyond, the opposite was true - and they were all raring to go and very keen indeed to join the virtual party. So party on, I said, and by gosh we did - all around the world and back again! Do pop over to my friend Gilly’s new blog if you have a moment. She’s a very interesting journalist and romance writer and this week she is talking about her monthly column in glossy DG Life magazine and about the subject of e-book marketing - in which she gives me a wee toot. On Wednesday this week I’ll be taking part in Talli’s Roland’s “If I could be anyone, I’d be...” blog hop extravaganza. So do pop back to see which celebrity I’m going to choose to be. It’ll be great fun! On Friday I have very special guest, Kenneth Rosenberg, talking about the launch of his brand new novel to Amazon Kindle in the wake of his Number 1 Bestseller ‘No Cure For The Broken Hearted’. Not to be missed! It was some highland gathering, Janice - you must have been exhausted! I had an absolute blast at the party! Best part was... no hangover the next day! The lovely Roast & Toast hostesses did a fantastic job of hosting the party and putting up with our shenanigans. Hoping your highland gathering results in loads of book sales for you. Hi Janice .. that's fantastic - 200 comments = great news .. and one successful party. Roast and Toast was delicious .. and no hangover as Melanie says!